The most famous 'spirit' photograph of them all: Abraham Lincoln with wife Mary Todd. What happens to us after we die? Do we go on to exist in some non-physical form or is death truly the end? Well, the answer to that question will probably never be found but the uncertainty created by death and longing for lost loved ones created a booming industry for photographers in the later part of the 19th century. 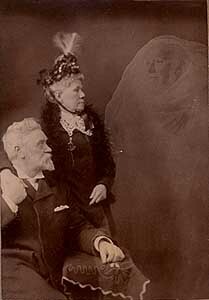 Almost as soon as the camera had been invented, some people started thinking that the almost magical photographic medium could be just the thing to prove the existence of spirits, and thus life after death. So far as we know, the first photograph of a supposed spirit was taken in 1860. 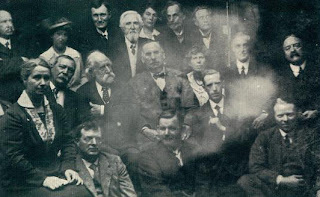 However, while ghost photos started to appear sporadically in the years after, one event alone produced an onslaught of ghost photos: the Civil War. The Civil War, which raged from 1861 to 1865 was the bloodiest war in American history, leaving over 625,000 Americans dead, more than were killed in every other American war combined. 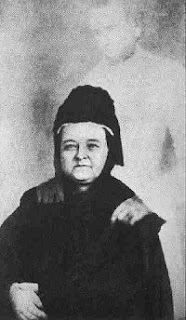 Needless to say, with so much sudden death, America in the late 1860s was not a happy country as it would probably have been impossible for any one family not to have been touched by the war. In this nationwide grief, some enterprising photographers saw the potential for big money. 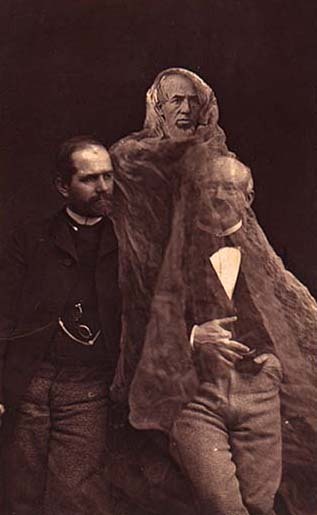 While no one knows who made the discovery, by the 1860s, the double exposure was common knowledge among photographers. In doing a double exposure, the photographer would take a picture of someone against a black background and then reuse the plate for another shot. 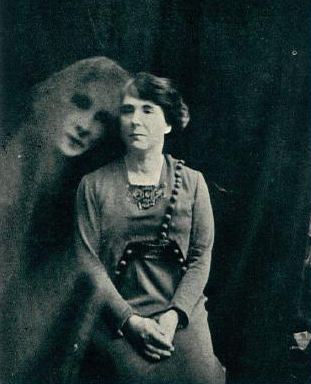 Result: an eerie, transparent figure of a person would be superimposed on the final picture. 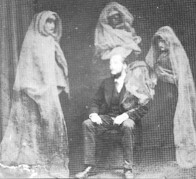 At the time, portraits would often need to be exposed for a few seconds so, by cutting the exposure short, the photographer could further muddle the 'ghost' and make it much harder for a clear image that could be identified by grieving relatives as their lost loved one. In the wake of the Civil War, some photographers of questionable morals seized on this opportunity and public ignorance to make big, big money. 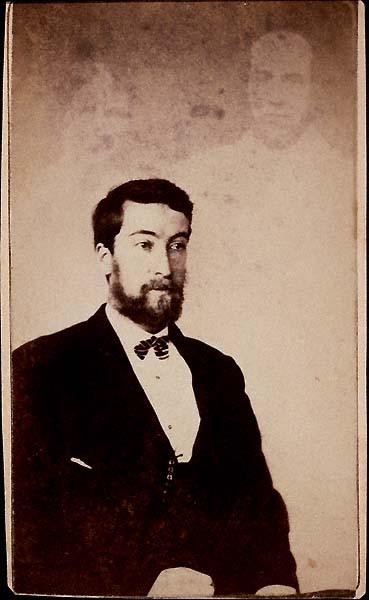 Of all the supposed spirit photographers, William Mumler of Boston, then New York was the most famous. At the time, getting one's picture taken was a big, and expensive, event. 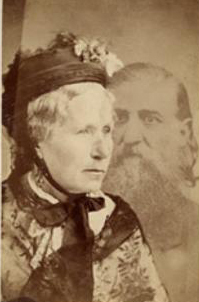 Mumler and other photographers, being careful to guard the double exposure secret, would then advertise that they had the ability to photograph spirits. Needless to say, with all the sudden death wrought by the war, people lined up for photos in the hope that their dead relatives would join them, paying far in excess of the normal portrait price and making the spirit photographers rich in the process. With the general public ignorance about photography, it seemed as though this fraud could go on indefinitely. Unfortunately for the fraudulent photographers, the good times did not last. 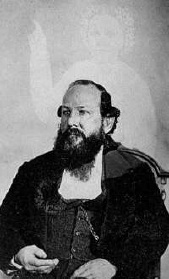 In 1869, William Mumler was put on trial for fraud, with his accusers, among them, P.T. Barnum, stating that he was using double exposures to fake spirit photographs. While Mumler himself was acquitted of the charges as there was no hard evidence against him, his trial let the big secret of spirit photographers, double exposure, out into the open. Result: once everyone knew about trick photography, people were less inclined to line up for photos when they knew that they were, more than likely, being swindled. By the turn of the 20th century, spirit photography as well as the whole spiritualism movement was consigned to the pages of history. However, while the spirit photographs of the 1800s have been essentially proven as fakes, the interest in catching ghosts on camera has not waned in the least. 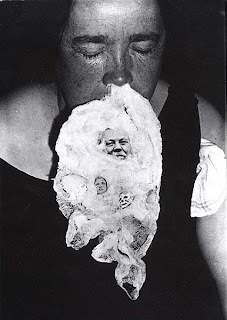 Just Google something to the effect of 'ghost pictures' for proof of this fact. And now. . . the best for last. . .